Bringing to life one of the most celebrated Bible stories, this picture book of the seven days of the Creation celebrates the origins of our abundant planet. - Publisher This beautiful picture book of the seven days of Creation celebrates the origins of our abundant planet. 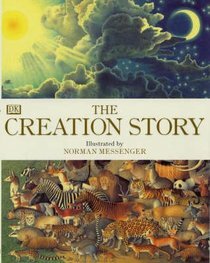 Combining amazingly detailed illustrations with the contemporary, easy-to-understand words of the New Living Translation, The Creation Story vividly brings to life the favourite Bible story taken from Genesis. Readers of all ages will marvel at the wonders of God's intricate creation. And it's an ideal book for parents and children to read aloud together too! This beautiful picture book of the seven days of Creation celebrates the origins of our abundant planet. Combining amazingly detailed illustrations with the contemporary, easy-to-understand words of the New Living Translation, The Creation Story vividly brings to life the favourite Bible story taken from Genesis. Readers of all ages will marvel at the wonders of God's intricate creation. And it's an ideal book for parents and children to read aloud together too! NORMAN MESSENGER began his career as an advertising art director in London before turning to freelance illustration. He is a highly regarded illustrator and was a founding member of the Association of Illustrators in Great Britain. His books for children include ANNABEL'S HOUSE, winner of the Redbook Award; MAKING FACES; and THE CREATION STORY. Born and raised in Liverpool, he now lives with his artist wife in Gloucestershire, England, and has two artist sons. IMAGINE is his first book with Candlewick Press.